So you’ve come up with a great idea for a piece of content. Fantastic! Spare a second to give yourself a pat on the back, and then roll up your sleeves. As the adage goes, “the devil lies in the details,” and going from the initial concept to the final product is a journey, whether you are writing the next “Game of Thrones” epic or constructing a blog post. I’ve created this post to provide a transparent look at what the journey from idea to a successful viral marketing campaign is like here at Fractl, and to honestly examine some of the challenges we faced and solutions we implemented along the way. Here’s how we took an idea and created a content campaign that generated these amazing results. Ideas are the lifeblood of content, whether it’s funny jokes for memes or more serious topics better suited for white papers. Our comprehensive guide, Inside Fractl’s Ideation Process, fully breaks down how we filter out the best ideas here at Fractl. Produce a more tangential campaign for the client. We produce a lot of sports content for Fanatics; feedback from our promotions team indicated the strict sports focus limited the success of our campaigns. Regarding taking a “tangential” approach, we wanted to do something more loosely related to sports compared with our usual analysis. Create something that has more viral potential. This can be difficult to do with sports topics, so we knew we would need to be more unorthodox than usual in our approach. Pro Tip: Earning your client’s trust will allow you to create riskier content. It’s important to note that we were able to pursue these goals because of our close relationship with Fanatics. 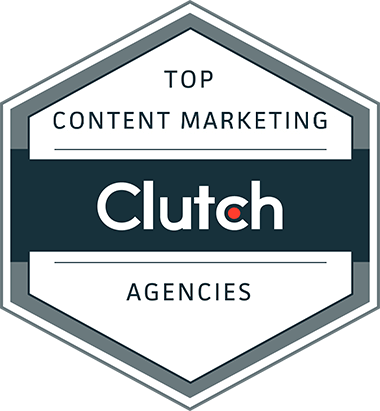 We had previously produced several campaigns and blog posts for them, and they trusted us because of prior success and our experience in virality. You can build trust with clients by being open, honest, and communicative throughout your engagement. Keeping in mind our goals during the ideation process, we came up with several ideas for campaigns with viral potential. Ideation is a core component of what we do at Fractl, and the entire creative team brainstorms collaboratively during these sessions. Here is a complete breakdown of our ideation process. The idea that received the highest internal score was something I pitched. 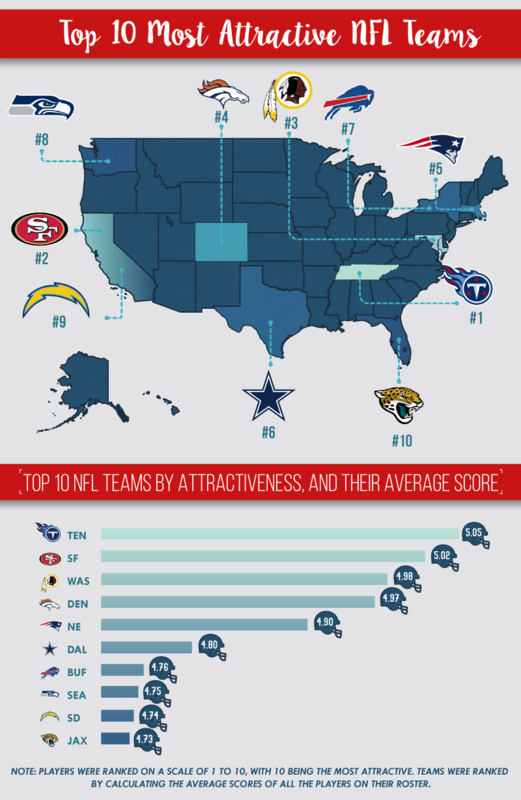 It was a ranking of the most attractive NFL players and teams. Our hope was that this would be relatable enough to make it newsworthy while at the same time being tangentially related to the Fanatics brand. Here is the initial idea as it was written. The “facial recognition API” referred to was based on blog posts we previously produced for Fanatics, when we used Microsoft’s Cognitive Services API to determine the happiest NBA teams. This meeting and feedback are examples in action of Fractl practicing what it preaches. We have talented members who contribute across a variety of departments. By looping each other in and having true cross-departmental discourse, not only is everyone on the same page when these campaigns are produced, but also the campaign is stronger because we utilized relevant team members’ unique experiences. After the client had approved the idea, it was time to begin production. Since I was the one who came up with the idea, I was assigned the task of producing this campaign. Our first task was to determine the methodology. However, as mentioned before, the idea was based on the false assumption that we could use Microsoft’s Cognitive Services API to measure attractiveness. After a brief conversation with more technically savvy members of the Fractl team, it became glaringly obvious we were going to need some other method of objectively determining attractiveness. Idea Deviation: I consulted with our VP of Creative, Kristin Tynski, about the issue. She suggested I pivot to using survey data to rank the players. She suggested I get respondents to rank each player on a scale of 1 to 10, with 1 being the least attractive and 10 being the most attractive. We would then average the scores to come up with the most attractive players and teams. Thanks to Kristin, I had a new plan of attack. We set the survey so respondents would be shown a head shot of NFL players with no way of knowing who they were, as the name and team information were stripped away. Ultimately, we were successful in gathering the information we needed. 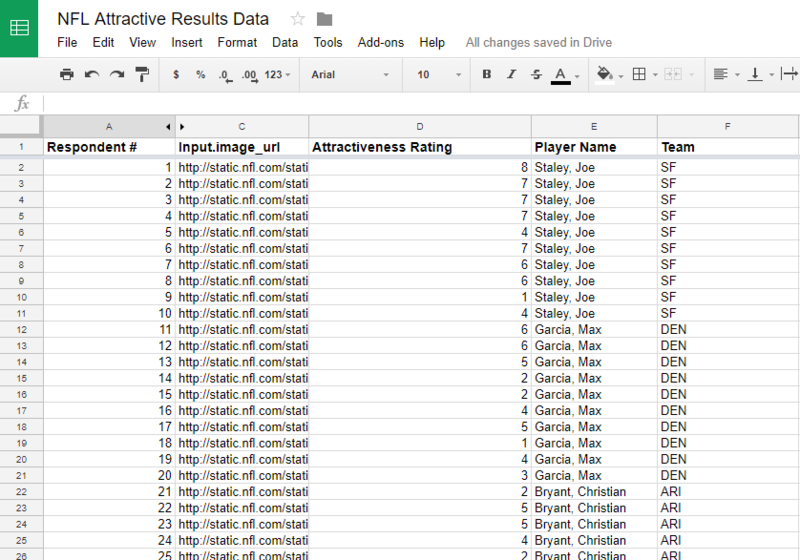 Here’s a screenshot of what the raw data looked like when we got it back. Beautiful! Now we were ready to analyze the data and create an outline to tell the story contained within. Once we had our data, it was time to outline what we planned to create with that data. The creative strategist creates a document that concisely outlines the project findings while also providing design direction for our outstanding graphics team. 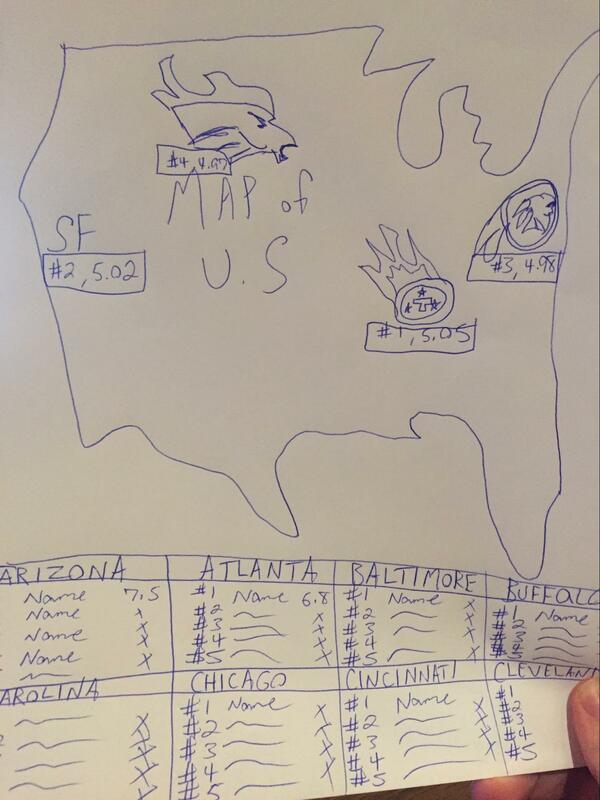 Here is a sketch I gave to the designer for the graphic on the most attractive teams. As you can see, our graphics team was composed of miracle workers. Here’s what they turned my sketch into. Based on the feedback from the team, we also broke up the asset to make it easier to digest. The most attractive players on each team became separate assets. Pro Tip: It’s critical to get fresh eyes on the project design. I loved the original design because I came up with it, but our promotions team provided critical feedback that saved me from going down the rabbit hole of my vision for the project. In the end, you create these projects for consumers who have nowhere near your familiarity with the subject. While these design edits were ongoing, we assigned a writer to compose the text for the project. As the promotions team was giving feedback on the design, I was also giving feedback to the writer, specifically based on what the client’s expectations were for this project. Our writers are charged with adding context to the data and fully expressing the ideas that are fleshed out in the graphics. Ideally, they draw the reader deeper into the project, explaining nuances of the data and calling out key takeaways. Eventually, the project was ready to be reviewed by our fantastic quality assurance team. They looked over every detail of each graphic and reviewed the text to make sure there were no grammatical errors. Below is a screenshot of their feedback. After the edits had been made, the project was finally ready for client review. Only after the client signed off on it was it ready to be passed to our media relations team. 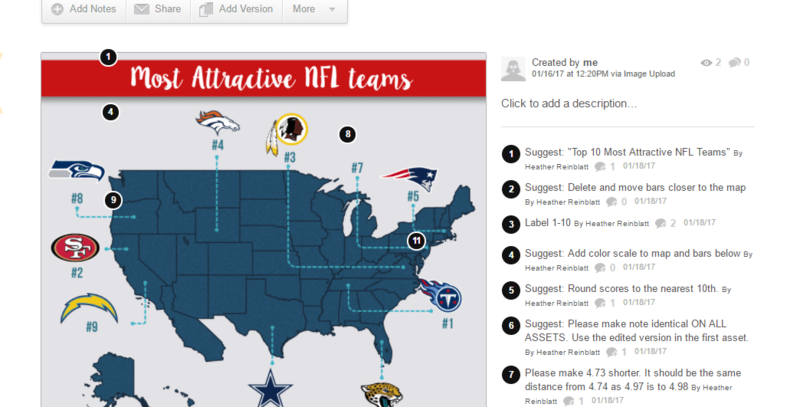 Here is the final project that was sent to them: Most Attractive NFL Teams. Our media relations department ensures our campaigns earn high-quality backlinks by promoting the content to writers and editors at top-tier publications. Once a campaign is ready for promotions, we shoot for having the exclusive live within 10 to 15 business days. The media relations associate tasked with pitching this campaign persevered and would ultimately wind up placing the exclusive with CBS Baltimore. 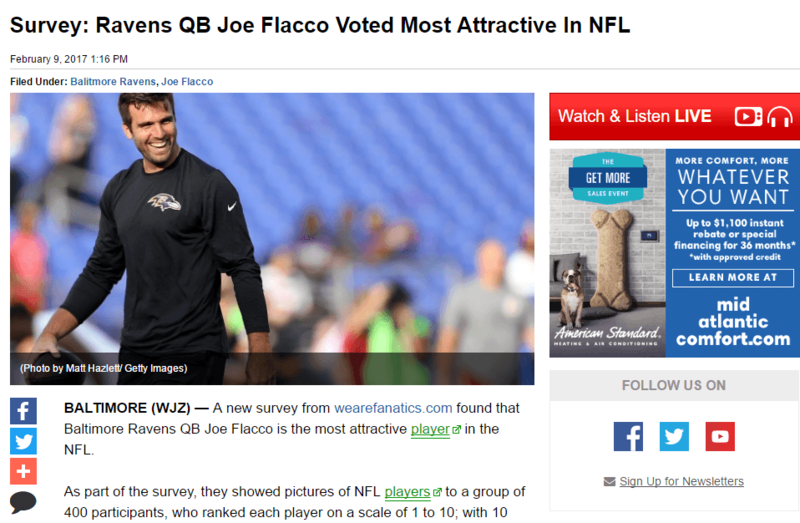 According to the study, Joe Flacco – the quarterback for the Baltimore Ravens – was ranked the most attractive NFL player. Our associate expertly leveraged this regional information to create a specific pitch for local publications like CBS Baltimore. Here’s the original story. Other CBS affiliates picked this story up, including CBS Pittsburgh, CBS Philadelphia, and CBS Washington. The beauty was that each of these pickups created new stories as they chose to focus on their local teams. This was by design because we hoped that including the top players from each team would result in regional syndication. This strategy paid dividends. Philadelphia wrote about quarterback Chase Daniels, Pittsburgh wrote about the most attractive Steelers, and Washington wrote about the Redskins. The Redskins caught wind of the story and tweeted about it from their official account, which generated a lot of buzz. #ICYMI: #Redskins voted 3rd-most attractive team in @NFL. Redskins player Will Compton was included in the top 10 most attractive players and tweeted this from his personal account. This led to him being interviewed for the Redskins official NFL site. Here’s the full story, including the video of the conversation. Compton also joked in the interview that he might have to add the honor to his Twitter bio. As mentioned in the beginning, going from the idea to final production is an odyssey, and no matter how good your plan is, there will always be bumps along the way. It’s important to have a team around you that you can trust to provide feedback and lend expertise. Don’t get discouraged. If you fail, try and try again! Remember, everything starts with an excellent idea. What happens after that is a mixture of skill, teamwork, and determination.